I saw this idea some time back and needed to try it. As you know, I like when things look like they've been dipped in confetti. I decided I would try this on our present for our new little nephew, who was born August 1, two days past his due date. He is SO cute! I've visited him twice but I can't wait to see him again! 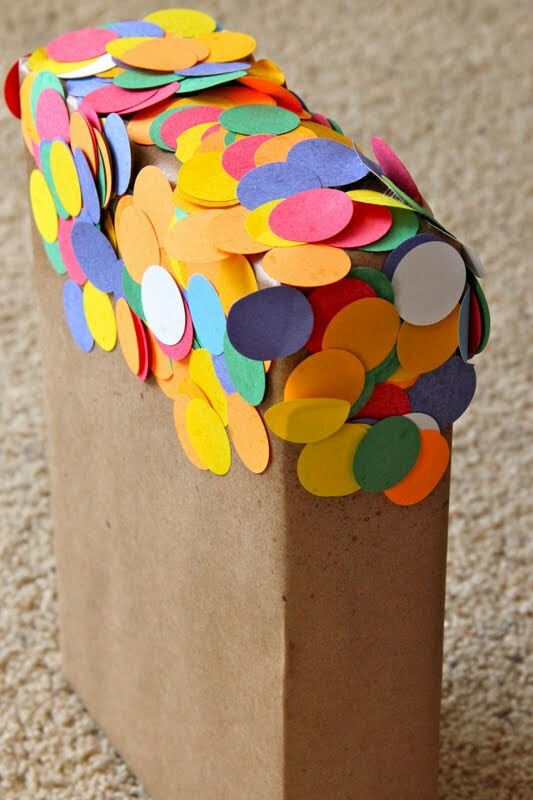 To achieve the dipped confetti look, either spray one end of your present with adhesive spray glue (I used this), or wrap a wide double-sided tape around one end of the present. Then dip the glue (or tape) side of present into the confetti. So easy! This is CUTE! I hope I get a confetti gift! Pretty! So great for a kids party. You sure did get a lot piled on there! I'm impressed. What a really cute idea. I remember the year my sister let my niece try out glitter. She sent me a card and I swear it was my next birthday before we finally got all of the glitter cleaned up LOL. So fun and perfect for any age! That is so clever! I bet it would be awesome dipped in glitter too! That is so fun and colorful! That's a cute idea! You can send me a present in confetti if you get bored! So freaking cute. I love it! What a cute idea!!! I would have never thought of this... but love it! This is cute! I love how you had a confetti manicure and now confetti presents. So festive and cute! That is sooooo cute!!! Veryy nice! That is so fun!! Love it! How adorable! Congrats on the new nephew too! I've got two nieces on the way and am so excited about them. Muy impressivo! I love this! I would do this for M's bday next weekend, but I don't think he would appreciate it. 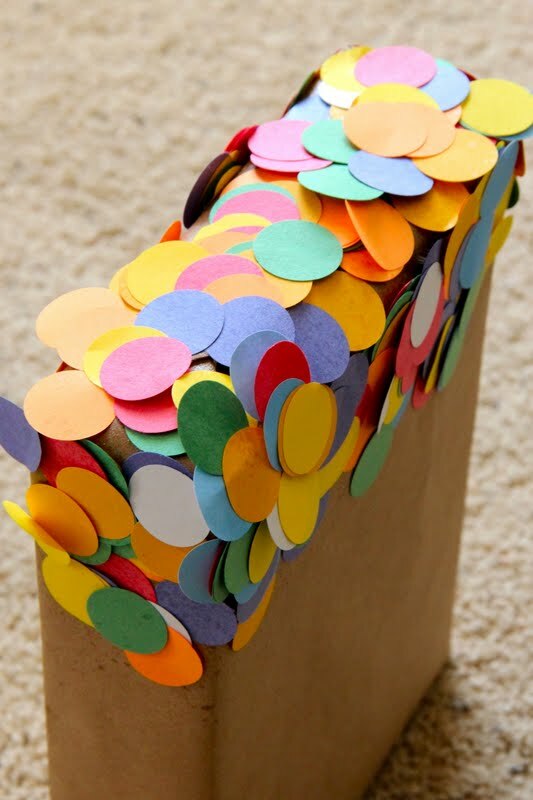 such a great idea :) who doesn't love confetti. so cute and so fun! i love using confetti when i send gifts to our nieces/nephews! This is such a creative and adorable way to wrap. Thanks for sharing. I can't wait until the nest time I gift wrap. How cute is that... very creative! i LOVE this idea! SO cute and creative :) Pinning now! Love it! So festive and fun. What a cute idea! I am definitely going to have to do this the next time I have to give a present! I love this! What an adorable and festive idea. And it's a great way to spice up plain wrapping paper. Thanks for the tip! I haven't seen this before and I'm obsessed now!! Can't wait to give my next gift and wrap it this adorable way! there's no denying that I love colored dots. This idea just makes me smile. Oh my gosh, this is SO SO adorable!! What a fun idea!